MAKE DELICIOUS ROUND & HEART-SHAPED WAFFLES -- With the Andrew James Waffle Maker Machine, you can create thin and crispy Scandinavian waffles within minutes. These waffles can then be torn into individual heart-shaped waffles for serving. ADJUSTABLE TEMPERATURE CONTROL -- Change the cooking temperature for perfect waffles every time. You can increase the temperature for crispy waffles and thick batter or turn it down to make light and fluffy desserts and snacks. 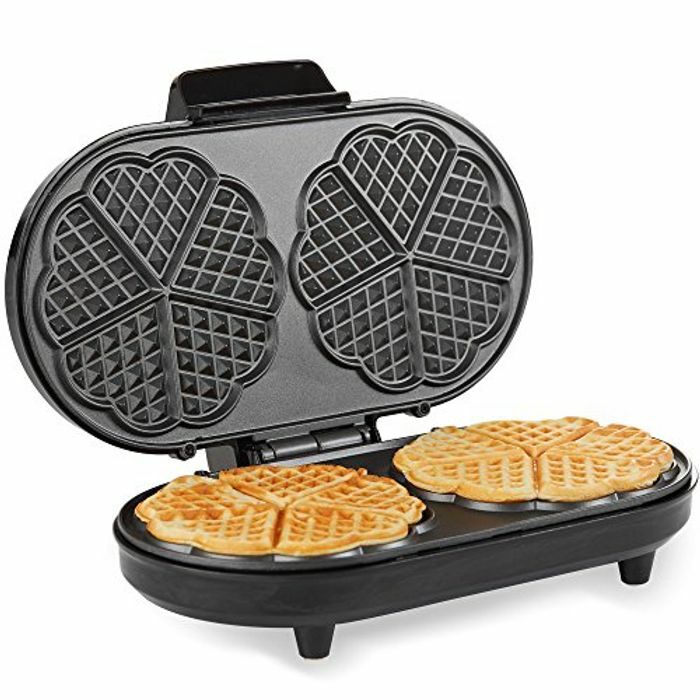 NON-STICK PLATES -- The fixed plates of this waffle machine have a non-stick coating for easy cooking with a touch of oil and easy cleaning. COOL-TOUCH HANDLE -- This lets you safely open the lid to check on cooking and turn your waffles for even browning. We have also included non-slip feet and built-in cord storage for safe and convenient use. 2-YEAR MANUFACTURER'S WARRANTY -- Shop with confidence. Your Andrew James Waffle Maker is covered by a 2-year manufacturer's warranty.